Olivia Wilde's dressing room (from the pages of InStyle) is nothing short of fabulous. But what if you don't have the space to dedicate an entire room to your dressing pleasure? Below are a few creative gems sure to inspire new ways to organize your closet. I love the idea of using a traditionally formal setting to display some of your most beloved shoes and clothing items. Trust me, if my boyfriend would let me my living room would be a fashion haven. I need to get a clothing rack. Desperately. My plan is to get two and find some old bookshelves at a yard sale, paint them, and install some LED lights in those puppies. I love Olivia Wilde and her amazing closet. The wood paneling is so rustic while the mirrored vanity and all her beautiful dresses are so glam. A perfect combo. I love the idea of using clothing and shoes as decor! That bedroom with the rack of clothes above it?! Out of this world!!! im also dreaming of having those closet someday!! If only me closet were so pretty! Envy is right! all of these are oh so creative! and i am jealous of olivia wilde's closet. need to get me some styling racks to switch up my wardrobe!! Olivia's is beyond amazing and I am dying to do the rod over my bed one we shall see lovely blog! So envious! Want all the clothes, wouldn't be able to choose only one closet! All of them are amazing! It's so funny I came across your post tonight as I just finished up a post about spring cleaning my closet for tomorrow. It must be fate! I hope you'll follow our Spring Sips and Style series and enter to win a pair of Tory Burch flip flops. This closet -- OMG. I need this in my life. I have an open rack in my room where I keep my current faves, and I love that it allows me to see everything in one place and reminds me to wear things that would otherwise be hiding in my closet! beautiful post!Thanks for stopping by me, I follow you! wow, these ideas are simple but so realisable! I think I am going to redecorade..
Hi sweetie!!! thanks for your comment! I follow you also in GFC! and bloglovin! would you like to follow each other!? OH, a girl's dream. I think I could plan my closet for a lifetime! Love the inspiration! I would turn my entire home into a display of pieces if only my husband found as much value in them as I do! :) Thanks for sharing and keep in touch. I want an awesome closet sooo bad! I love all of these and that idea of a simple rack to display a few gems is such a good idea. OH, that's amazing!! Love the post! Thanks for visiting your blog... 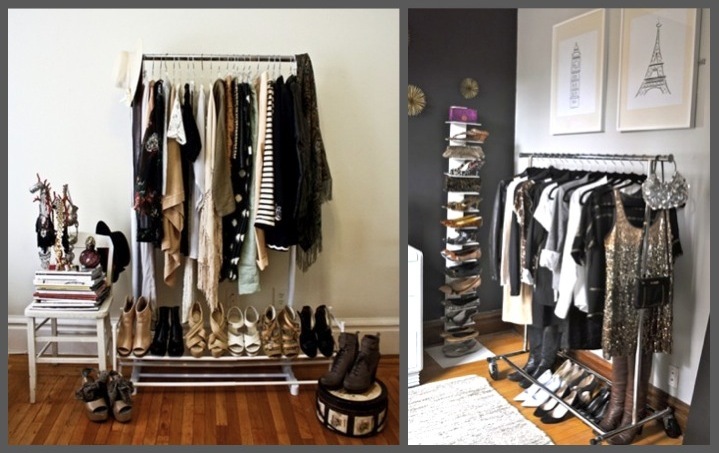 I love this post on wardrobe/ closets! I have mine on a rail! Although it's rather overcrowded! Following you! I kind of love the idea of an exposed closet! Great inspirations! Sweet post . Makes me feel that I really need to tidy my runner rail , clothing everywhere .